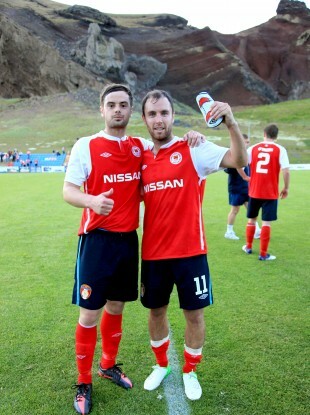 Greg Bolger and Sean O'Connor of St Pat's celebrate after their first round victory in Iceland. SLIGO ROVERS WILL avert their league-leading focus to Europe this evening when they face FC Spartak Trnava of Slovakia. St Patrick’s Athletic will be in Bosnia as they pit their wits against NK Široki Brijeg. The Saints slipped up domestically against Drogheda at the weekend but were solid winners away in Iceland on Thursday last. Rovers manager Ian Baraclough has said his side will not fear their Slovak opponents second round qualifying first leg in Slovakia. Baraclough travelled to Trnava last week to scout a team that finisjed second in the Slovakian league last season. He said, “It is different to watching on a screen. You get a feel for the atmosphere, their style of play and what to expect. The former QPR and Scunthorpe player witnessed a Trnava team that ‘ran out of steam in the last 30 minutes’ of their season opener and got frustrated by a team they ‘expected to beat’. There is no way we’re going to sit back and just try to soak up pressure for 90 minutes. St Pat’s were away goal winners against IBV Vestmannaeyjar in the first round but continued a frustrating trait of inconsistency when they lost 2-0 against 10-man Drogheda at the weekend. The Široki Brijeg team contains several Croatians, former Bosnia and Herzegovina international Dalibor Šilić, and 34-year-old Brazilian playmaker Wagner. Pats’ manager Liam Buckley believes the game represents a great opportunity for players and management to test themselves against a strong side with a good history in European competition. He told the club website, “They good side, they’ve either won or finished runners-up in their domestic league and cup for the past few years. Buckley confirmed that injuries mean Pat Flynn and Mark Rossiter will not be part of the squad travelling to Bosnia. Email “Europa League previews: Testing away encounters for St Pat's and Sligo”. Feedback on “Europa League previews: Testing away encounters for St Pat's and Sligo”.